November 30, 2015 marked the opening of the 21st Conference of the Parties to the United Nations Convention on Climate Change (UNFCCC) at Le Bourget in Paris, France. This meeting also serves as the eleventh meeting of the Parties to the Kyoto Protocol (CMP). The negotiations here within the next two weeks seek to achieve a universal agreement that will come into action starting the year 2020, after the second commitment period of Kyoto Protocol. President of France, Mr. François Hollande welcomed thousands of delegates and 150 heads of state at the opening of the Leader’s Event. He expressed condolences to his people after the Paris attacks and stressed the responsibility of this generation to “leave children with more than a world free of terror,” and climate disaster. 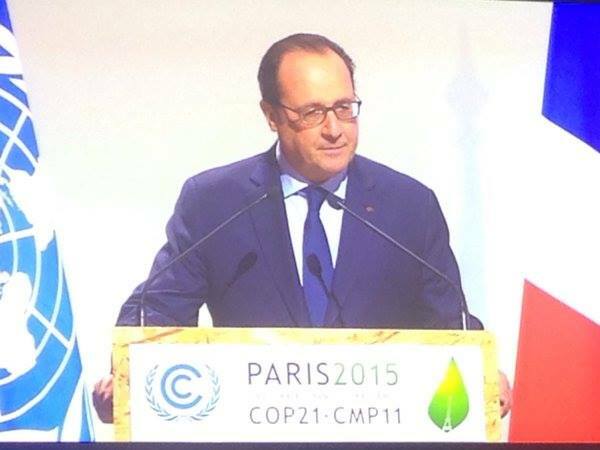 Mr. Hollande provided a justice perspective on climate change, which is a crucial lense for the negotiations. Climate change is not only about the environment and saving the world but it is also about people. People are being affected by climate change every day and some are forced to move out of their homeland. The unjust truth is that, as Mr. Hollande put, “the poorest countries with the lowest greenhouse gas emissions are the most vulnerable and are even further affected [by climate change].” Reference to the justice aspect of climate change is a huge step forward. 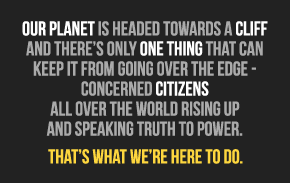 Mainstream media may be busy broadcasting references to ‘key’ phrases from speeches, but we all know that mentioning and acting do not come together, especially in the UNFCCC space. Despite what was announced at the opening plenary yesterday, to have transparency in the process of agreement, the entire spin-off group meeting was closed for observers last evening, and many more will be closed off throughout this week. While this negotiation is taking place and while many corporations in industrialized countries are having debates on how carbon emission reduction affects businesses, people in other parts of the world are losing their lands and lives. Will the final agreement be a fair and just agreement for the most vulnerable developing countries or will it be a favorable agreement for developed countries with power? In the past months, over seventy countries have submitted their Intended Nationally Determined Contributions (INDCs) – the outlines of intended action each countries are to take post-2020 under the new climate agreement. At one of the side events, Japanese Ministry of Foreign Affairs, Yasuhisa Kawamura, presented and explained Japan’s INDCs. Japan’s basic stance for COP21 and INDCs is to have “fair and effective” agreement with “contribution from both developing and developed countries.” Japan is intending to assist development of developing countries through financing and innovation and is committed for 26% greenhouse gas emission reduction by 2020 compared to 2013. Mr. Kawamura praises this INDCs as fair and ambitious – but is it really? We argue that to stay below 2 or 1.5 degree Celsius warming from pre industrialized level, developed country must have zero carbon emission by 2030 and zero carbon emission for developing countries by 2050. The Global North, which includes Japan, posses a historical responsibility in polluting the atmosphere. We have polluted more than we could, leaving no space for developing countries to further pollute the atmosphere. Science has proven that the Global North has the technology, finance and capacity to become zero emission by 2030. Thus, a 26% reduction by 2030 is neither ambitious nor fair for developing countries. We have polluted more than enough. It is our (Global North) responsibility to facilitate clean development of developing countries and further push for an equitable and ambitious agreement which is necessary to save this planet from catastrophic climate disasters.